After the unplanned detour from the Kumano Kodo pilgrimage trail that led me to the Instant Ramen Museum and a truly spicy ramen from Ippudo, it was time to get on with my plans. If I couldn’t go on being the pilgrim on a spiritual path, at least I could go and seek out material sustenance. 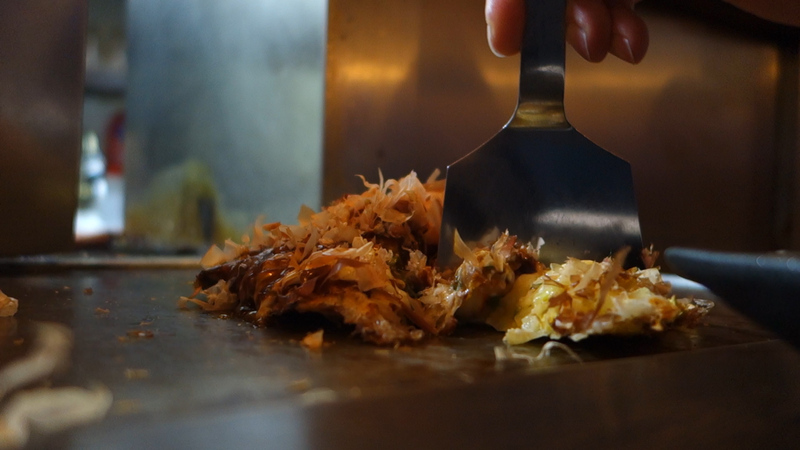 What better, in Osaka, than to go and see what okonomiyaki really is about? To get to know that, I went into Osaka’s major area for going out and having everything and anything to eat, Dotonbori. 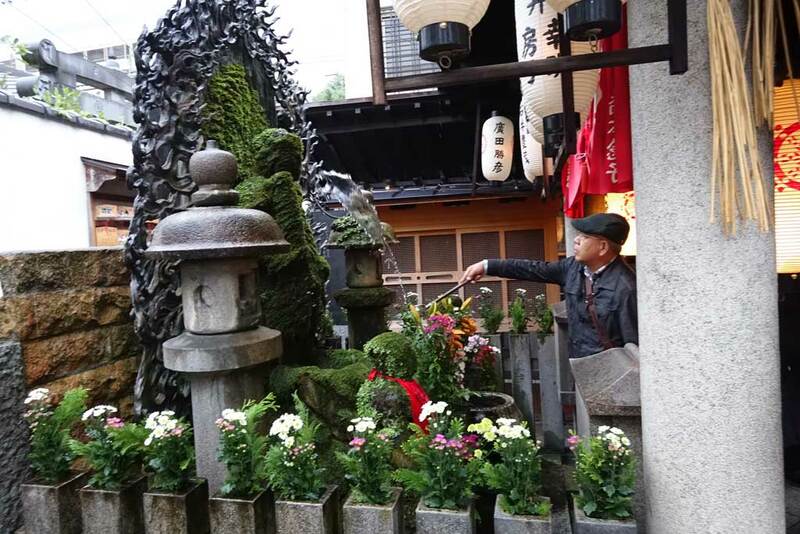 For okonomiyaka, the Osakan “pancakes”, Houzenji Sanpei came highly recommended, and it did look good, so there I went. Dotonbori is fascinating. Partly wider covered roads, mainly small alleys in between, a bit of rowdy entertainment – Pachinko and gaming arcades, I mean – and lots and lots of places to eat. A bit aside (across from the major road there), there are also lots of shops (not least the BIC Camera where I ended up getting a new Sony RX0 😉 ). 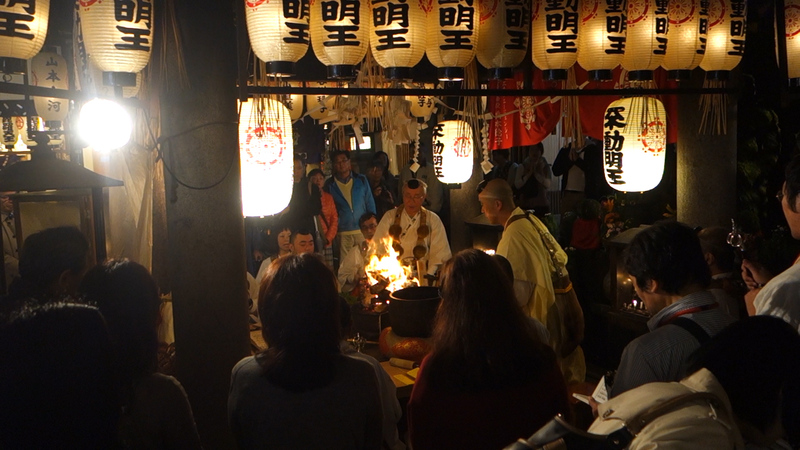 And if you get lucky, like I did, a Goma-Kane fire ceremony is taking place right while you come by. Like so many of the places in the area, Houzenji Sanpei is small and, depending on how you want to look at it, crowded or intimate. A few tables and chairs, a few more chairs right at the kitchen, and that’s it. Careful at the kitchen counter! The space for your plate is like a table; the space just beyond that plate-width, however, is part of the grill! 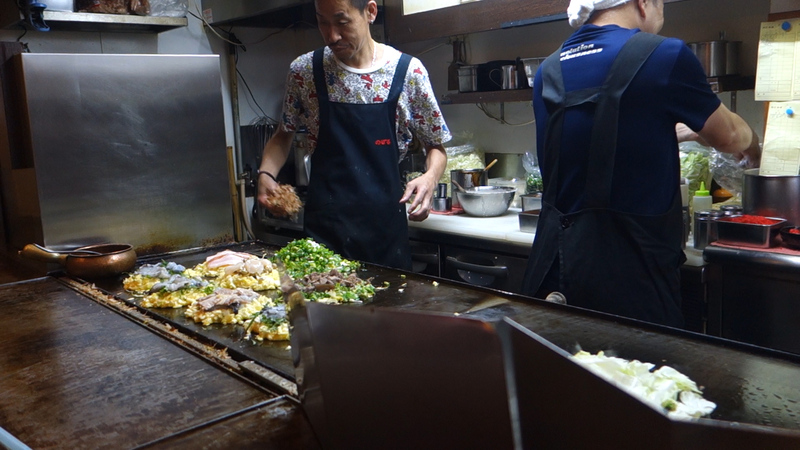 As a single person, I got a stool at the ‘bar’ at once, checked through the (English) menu and had a literal front-row seat to the cooking action. The menu offers a few recommended combinations of what could be put on the ‘pancake’, which can be ordered like that or taken as inspiration for one’s own selection. Not wanting to be too adventurous or to overdo it, here, I simplified a recommendation and went for an okonomiyaki with nothing but shrimp and shiso. That was just too interesting as I have been growing a few different kinds of shiso, but had not known it to even be used as such a major ingredient. Let’s just say, if this is a pancake, then a wedding cake is a quick snack. There is enough piled on top, I still don’t know how the ingredients ever managed to cook through and the cook managed to turn it all.